OPTION 1 - LOSS MITIGATION OR "WORKING IT OUT"
1. Loan Modification - Available on a limited number of VA loans with lender approval, loan modification is for those who have suffered a long term hardship. After supplying the appropriate information to the lender you may qualify to lower the interest rate or extend the term of the loan resulting in lower payments. There are fees, property taxes must be current, and other lienholders or mortgagees must agree to be subordinate to the first mortgage. 2. VA Loan Refunding - In certain cases the VA may agree to purchase the loan from your lender. When they do so that are acting according to federal law and the delinquency is added to the principal balance and the loan is re-amortized. 3. Deed in Lieu of Foreclosure - If you are facing a long term hardship and the house has been on the market for 90 days, you might be able to deed the home back to the lender in lieu of a foreclosure. The house has to of course be actively listed and you must be able to prove that as well as provide a complete financial package. No other liens can exist as well. When you deed the home back you give up all of your rights to the property and the lender should waive all potential deficiency judgement rights. 4. Short Payoff or Short Sale - Again, if you are suffering from a long term financial hardship, and cannot maintain the loan or if you need to sell to avoid a default loss on the property, the lender may be willing to help you complete a "short sale". In order to do this you have to find a "qualified buyer". If successful there may be consequences as a result of the settlement for less than owed on your credit report and the IRS will want you to treat the forgiven debt as income. Depending on where you live the lender may be able to seek a deficiency judgement as well. 5. Repayment Plan - If you have incurred a short term financial hardship and the loan is at least two months past due, a payment plan may be negotiated based on your income and budget allowing you to catch up the mortgage arrears. 6. Special Forbearance for FHA loans - For those with a short term financial hardship and a loan delinquency of 3 months to 1 year. This is designed to give a little more help than the repayment plan as the repay term can be as long as 12 to 18 months. 7. Partial Claim - Certain types of loans FHA and Some Freddie Mac loans qualify. This is essentially the movement of your arrears into a second mortgage. The Secretary of Housing Urban Development is the lienholder. There is no interest and there is no payment until the the first loan is paid off. It is limited to no more than 12 months of past due payments. If you have equity, a decent credit score, and no default notice, you may be able to get a loan with a better payment. Be careful though, you may end up with a worse loan in the long run. If a modification or a refinance is not working, you can try to sell. You may have to give up some equity to get out of the situation but often it is a worthwhile price to pay to preserve your credit and peace of mind. If there has been an error in the loan and the mortgage holder refuses to correct it, the loan appears to have been "abusive", or some serious mortgage servicing problems exist, than litigation may be an avenue to deal with the foreclosure. Bankruptcy is often an effective way to deal with a foreclosure. A chapter 13 bankruptcy allows the homeowner to reorganize their debt and pay it back according to a plan that is approved by the court. 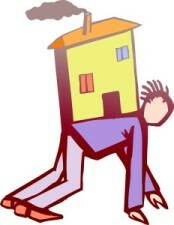 A bankruptcy can be an option regardless of the results of the mortgage workout results and often is. I will usually analyze a foreclosure in relation to a chapter 13 bankruptcy in order to ensure that this option exists if the workout fails. If you are facing a foreclosure, you need to obtain your information from a licensed and experienced attorney. Click here to contact me with questions.